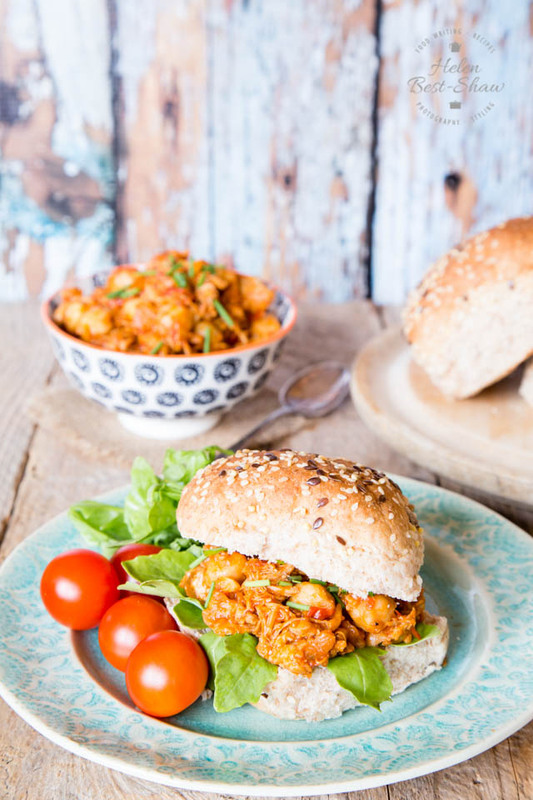 Enjoy these protein packed pulled chicken and chickpea sloppy joes as a great alternative to yet another burger. 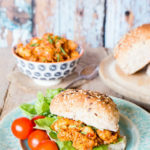 I’m a fairly recent convert to Sloppy Joes, and they have become a regular feature on my meal plan as they tick my Fuss-Free boxes of being easy, adaptable, delicious and as well as they can be prepared ahead. The original Sloppy Joe is an American classic – a sandwich with a beef ragu filling, with the bread soaking up all the delicious juice. Given my liking for wet foods – anything with a sauce – it is not surprising that I like them, and now eat them on a regular basis! Today’s Sloppy Joe is a protein packed mix of pulled chicken thighs and chickpeas in a lightly spiced tomato sauce, it would be equally as good served as a baked potato topping, or as a pasta sauce as well as in a bun. High protein diets have become increasingly common for many. We really find that cutting down the carbs at lunchtime works for us, making it easier to be sharp during the afternoon. A carb-rich lunch tends to just put us to sleep for the afternoon, and while a siesta is a nice idea it does mean that we don’t get nearly as much done. We also find that eating more protein during a meal helps us to feel fuller for longer, so there’s less temptation and tendency to snack. Eating more protein is, of course, especially important for those who are training or exercising intensively. 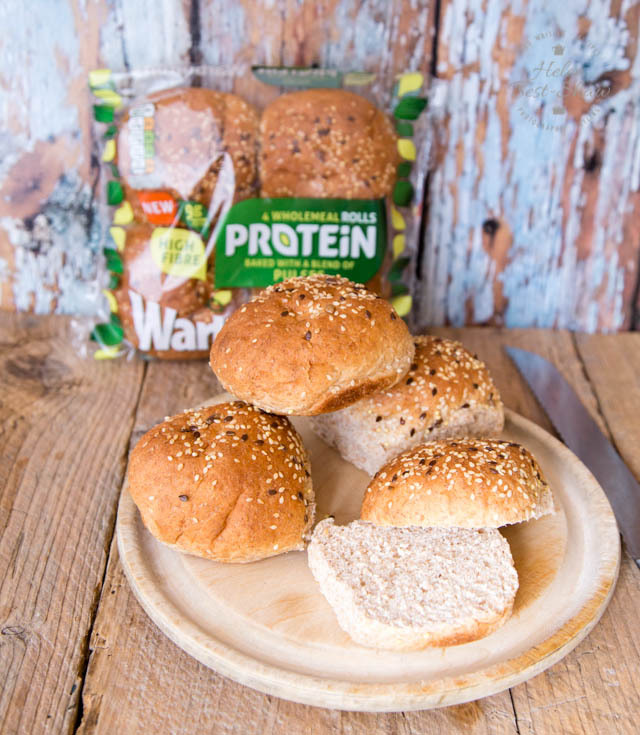 Warburtons have launched a range of protein enriched bread, rolls, sandwich thins and flatbreads, with the enrichment being derived from including pulses as well as wholemeal flour. The products all have a great texture and taste just like their regular counterparts. Of course they would also be delicious with beef, or used as for bun in a steak bánh mì. We especially enjoyed the rolls, with their soft crumb and topped with seeds, perfect filled with a pulled chicken and chickpea sloppy Joe for a quick lunch. Serve alongside my Crispy Bhindi or Tomato Salad. If you try this Pulled Chicken and Chickpea Sloppy Joes please tag #FussFreeFlavours on Instagram or Twitter. It is amazing for me when for me when you make one of my recipes and I really do love to see them. You can also share it on my Facebook page. Please pin this recipe to Pinterest too! Thanks for reading Fuss Free Flavours! 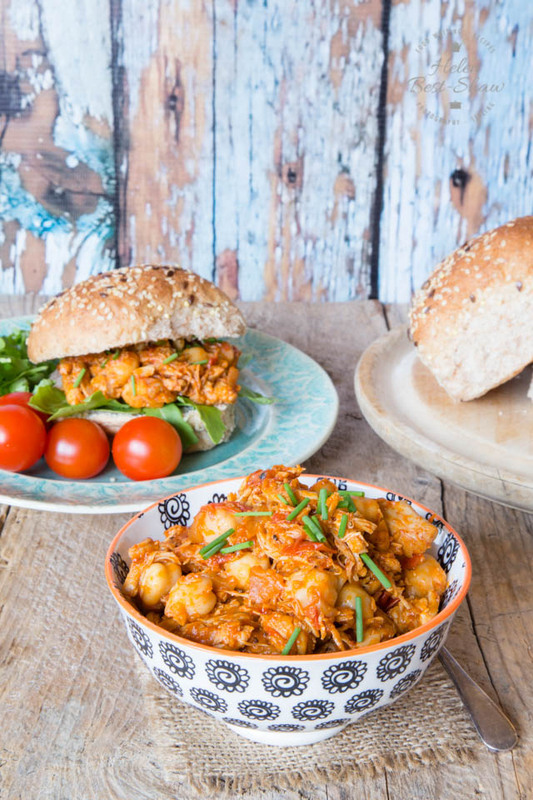 These protein packed pulled chicken and chickpea sloppy joes are the perfect filling for a bun or baked potato. Enjoy them healthy and tasty alternative to yet another hamburger. Quick, simple and delicious! Heat the oil in a frying pan with a lid, or a small saucepan. Add the onion and garlic and fry until translucent. Add the chicken pieces and cook for a few minutes. Add the rest of the ingredients. Cover the pan and turn the heat right down and allow to cook for about half an hour, stirring from time to time, and adding a little more water if needed. When cooked, shred the chicken, add the chickpeas and a little more chilli sauce if needed. The mixture freezes well. Defrost overnight in the fridge and reheat in a pan on the hob, or in the microwave.